The original Spring Ranche, located two miles south of here on the north side of the Little Blue River, was founded about 1863. James Bainter, the first permanent settler, operated a store and inn for travelers along the Oregon-California Trail. The ranche was burned in 1864 when Lakota Sioux and their allies attacked settlements along the Little Blue. Spring Ranche was later rebuilt. The village of Spring Ranch dates from 1870 when a post office was established south of the river. A saw mill was in operation a year later. In 1886 the townsite moved across the river, where the St. Joseph and Grand Island Railroad was being built. The village once boasted several businesses and a population of about 100, but few traces remain today. In 1885 Spring Ranch residents Elizabeth Taylor and her brother Thomas Jones were accused of barn burning and murder. Before they could be tried, they were lynched by a mob on March 15. Taylor and Jones, along with other early settlers, are buried in the Spring Ranch Cemetery. 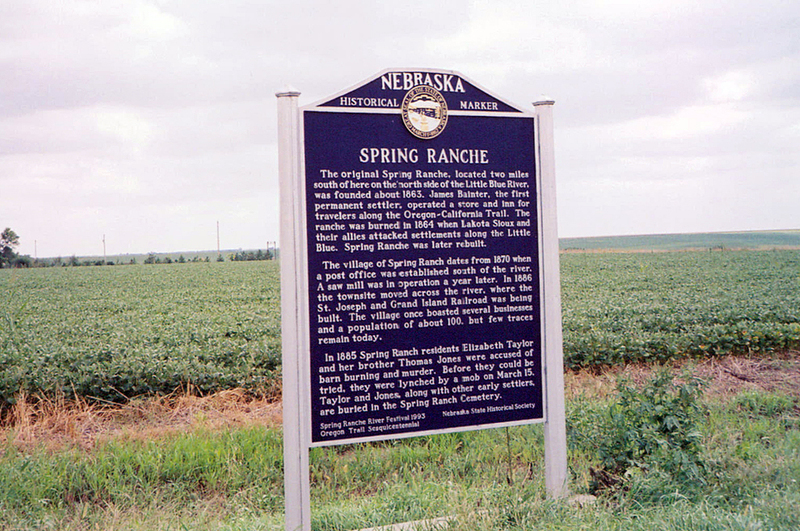 “Spring Ranche,” Explore Nebraska History, accessed April 18, 2019, https://mynehistory.com/items/show/87.